WARNING: Carbamazepine may rarely cause very serious (possibly fatal) skin reactions. Certain ethnic groups (including people of Asian/South Asian descent) are at greater risk. Your doctor may order a blood test (HLA-B 1502) to measure your risk before prescribing this medication. If the blood test shows you are at greater risk, discuss the risks and benefits of carbamazepine and other treatment choices with your doctor. Such skin reactions have developed mostly within the first few months of treatment. Seek immediate medical attention if you develop any of the following symptoms: skin rash/blisters/peeling, itching, or swelling. Ask your doctor or pharmacist for more details. This drug has rarely caused a severe decrease in bone marrow function (aplastic anemia, agranulocytosis). Your doctor will monitor your blood counts to minimize the chance of this side effect. Keep all medical and laboratory appointments. Tell your doctor immediately if any of these rare but very serious side effects occur: signs of infection (e.g., fever, persistent sore throat), unusual weakness or fatigue, or easy bleeding/bruising. 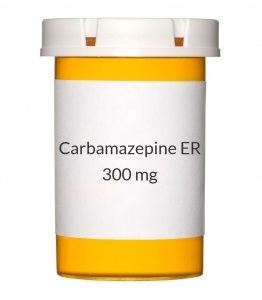 USES: Carbamazepine is used to prevent and control seizures. It is known as an anticonvulsant or antiepileptic drug. It is also used to relieve one type of nerve pain (trigeminal neuralgia). This medication works by reducing excessive nerve signals in the brain and restoring the normal balance of nerve activity. OTHER USES: This section contains uses of this drug that are not listed in the approved professional labeling for the drug but that may be prescribed by your health care professional. Use this drug for a condition that is listed in this section only if it has been so prescribed by your health care professional. This drug may also be used to treat certain mental/mood conditions (e.g., bipolar disorder, schizophrenia) and other types of nerve pain. HOW TO USE: Read the Medication Guide provided by your pharmacist before you start taking carbamazepine and each time you get a refill. If you have any questions, ask your doctor or pharmacist. If you are taking the extended-release tablets, take this medication by mouth, usually 2 times a day with meals, or as directed by your doctor. Do not crush or chew extended-release tablets. Doing so can release all of the drug at once, increasing the risk of side effects. Also, do not split the tablets unless they have a score line and your doctor or pharmacist tells you to do so. Swallow the whole or split tablet without crushing or chewing. Inspect the tablets for chips and cracks. Do not take any damaged tablets. If you are taking the extended-release capsules, take this medication by mouth, usually 2 times a day with or without meals, or as directed by your doctor. Swallow the capsules whole. Do not crush or chew the capsules. If you have trouble swallowing the capsules, you may open them and sprinkle the contents onto a teaspoonful of applesauce or other soft food. Swallow the food/medication mixture immediately. Do not chew the mixture or prepare a supply in advance because this may increase side effects or destroy the drug. Dosage is based on your medical condition and response to treatment. Your doctor may gradually adjust your dose. Follow these directions carefully. For the treatment of trigeminal nerve pain, do not take more than 1,200 milligrams per day. Avoid eating grapefruit or drinking grapefruit juice while being treated with this medication unless your doctor instructs you otherwise. Grapefruit juice can increase the amount of certain medications in your bloodstream. Consult your doctor or pharmacist for more details. Take this medication regularly at evenly spaced intervals in order to get the most benefit from it. Remember to use it at the same times each day to keep the amount of medicine in your body at a constant level. Do not take more of this medicine than prescribed or stop taking it without consulting your doctor. Some conditions (e.g., seizures) may become worse when the drug is suddenly stopped. Your dose may need to be gradually decreased. Tell your doctor if your condition does not improve or if it worsens. SIDE EFFECTS: See also the Warning section. Nausea, vomiting, dizziness, drowsiness, or unsteadiness may occur as your body adjusts to this medication. If any of these effects persist or worsen, notify your doctor or pharmacist promptly. An empty tablet shell may appear in your stool, but it is harmless. Remember that your doctor has prescribed this medication because he or she has judged that the benefit to you is greater than the risk of side effects. Many people using this medication do not have serious side effects. Tell your doctor immediately if any of these unlikely but serious side effects occur: swelling of the ankles/feet, fatigue, fast/slow/irregular heartbeat, persistent or severe headache, fainting, trouble urinating, change in the amount of urine, decreased sexual ability, unusual eye movements (nystagmus), vision changes, hearing problems, pain/redness/swelling of the arms or legs, numbness/tingling of the hands/feet, sun sensitivity, joint pain, hair loss. A small number of people who take anticonvulsants for any condition (such as seizure, bipolar disorder, pain) may experience depression, suicidal thoughts/attempts, or other mental/mood problems. Tell your doctor immediately if you or your family/caregiver notice any unusual/sudden changes in your mood, thoughts, or behavior including signs of depression, suicidal thoughts/attempts, thoughts about harming yourself. Tell your doctor immediately if any of these rare but very serious side effects occur: persistent nausea or vomiting, severe stomach/abdominal pain, yellowing eyes and skin, dark urine, swollen glands, persistent mouth sores. Seek immediate medical attention if any of these rare but very serious side effects occur: chest pain, trouble breathing. A very serious allergic reaction to this drug is unlikely, but seek immediate medical attention if it occurs. Symptoms of a serious allergic reaction may include: rash, itching/swelling (especially of the face/tongue/throat), severe dizziness, trouble breathing. This is not a complete list of possible side effects. If you notice other effects not listed above, contact your doctor or pharmacist. In the US - Call your doctor for medical advice about side effects. You may report side effects to FDA at 1-800-FDA-1088. In Canada - Call your doctor for medical advice about side effects. You may report side effects to Health Canada at 1-866-234-2345. PRECAUTIONS: Before taking carbamazepine, tell your doctor or pharmacist if you are allergic to it; or to other anti-seizure medications (e.g., phenobarbital, phenytoin) or tricyclic antidepressants (e.g., amitriptyline, desipramine); or if you have any other allergies. This product may contain inactive ingredients, which can cause allergic reactions or other problems. Talk to your pharmacist for more details. This medication should not be used if you have certain medical conditions. Before using this medicine, consult your doctor or pharmacist if you have: decreased bone marrow function (bone marrow depression), a certain blood disorder (acute intermittent porphyria). Before using this medication, tell your doctor or pharmacist your medical history, especially of: high blood pressure, blood clots, blood vessel disease, heart disease (e.g., coronary artery disease, congestive heart failure, heart rhythm or conduction disorders), kidney disease, liver disease, glaucoma, mental/mood disorders, certain types of seizures (atypical absence seizures), history of decreased bone marrow function due to other drugs. This drug may make you dizzy or drowsy. Do not drive, use machinery, or do any activity that requires alertness until you are sure you can perform such activities safely. Limit alcoholic beverages. This medication may make you more sensitive to the sun. Avoid prolonged sun exposure, tanning booths or sunlamps. Use a sunscreen and wear protective clothing when outdoors. During pregnancy, this medication should be used only when clearly needed. It may harm an unborn baby. However, since untreated seizures are a serious condition that can harm both a pregnant woman and her unborn baby, do not stop taking this medication unless directed by your doctor. If you are planning pregnancy, become pregnant, or think you may be pregnant, immediately talk to your doctor about the benefits and risks of using this medication during pregnancy. If you are pregnant, prenatal care that includes tests for defects is recommended. Since birth control pills, patches, implants, and injections may not work if taken with this medication (see also Drug Interactions section), discuss reliable forms of birth control with your doctor. This medication passes into breast milk. Consult your doctor before breast-feeding. DRUG INTERACTIONS: See also the How to Use section. Your healthcare professionals (e.g., doctor or pharmacist) may already be aware of any possible drug interactions and may be monitoring you for it. Do not start, stop or change the dosage of any medicine before checking with them first. Avoid taking MAO inhibitors (isocarboxazid, linezolid, methylene blue, moclobemide, phenelzine, procarbazine, rasagiline, selegiline, tranylcypromine) within 2 weeks before, during, and after treatment with this medication. In some cases a serious (possibly fatal) drug interaction may occur. This drug should not be used with the following medications because very serious interactions may occur: delavirdine, etravirine, nefazodone, rilpivirine, voriconazole. Before using this medication, tell your doctor or pharmacist of all prescription and nonprescription/herbal products you may use, especially of: other anti-seizure medications (e.g., felbamate, valproic acid), lithium, SSRI antidepressants (e.g., fluoxetine), telithromycin, tramadol, drugs affecting liver enzymes that remove carbamazepine from your body (such as azole antifungals-including itraconazole, macrolide antibiotics-including erythromycin, cimetidine, rifamycins-including rifabutin, St John's wort, propoxyphene, danazol, calcium channel blockers-including verapamil). Carbamazepine can cause certain liver enzymes to speed up the removal of other drugs from your body, possibly decreasing their effectiveness. These affected drugs include (this is not a complete list): certain cancer drugs (dasatinib, lapatinib, sunitinib, irinotecan), caspofungin, cyclosporine, doxycycline, levothyroxine, psychiatric medications (e.g., clozapine, haloperidol, risperidone, trazodone), theophylline, warfarin. This medication may decrease the effectiveness of hormonal birth control such as pills, patch, or ring. This could cause pregnancy. Discuss with your doctor or pharmacist if you should use additional reliable birth control methods while using this medication. Also tell your doctor if you have any new spotting or breakthrough bleeding, because these may be signs that your birth control is not working well. Tell your doctor or pharmacist if you also take drugs that cause drowsiness such as: certain antihistamines (e.g., diphenhydramine), anti-anxiety drugs (e.g., diazepam), medicine for sleep (e.g., sedatives), muscle relaxants, narcotic pain relievers (e.g., codeine), psychiatric medicines (e.g., phenothiazines such as chlorpromazine, tricyclic antidepressants such as amitriptyline), tranquilizers. Check the labels on all your medicines (e.g., cough-and-cold products) because they may contain ingredients that cause drowsiness. Ask your pharmacist about the safe use of those products. This product can affect the results of certain lab tests (e.g., thyroid function, some pregnancy tests). Make sure laboratory personnel and your doctors know you are using this drug. This document does not contain all possible interactions. Therefore, before using this product, tell your doctor or pharmacist of all the products you use. Keep a list of all your medications with you, and share the list with your doctor and pharmacist. OVERDOSE: If overdose is suspected, contact your local poison control center or emergency room immediately. US residents can call the US national poison hotline at 1-800-222-1222. Canadian residents should call their local poison control center directly. Symptoms of overdose may include: slowed breathing, loss of consciousness, muscle twitching, uncontrolled movements, very fast heartbeat. NOTES: Do not share this medication with others. Laboratory and/or medical tests (e.g., complete blood count, blood chemistry, kidney and liver function tests, eye exams, carbamazepine blood levels) should be performed periodically to monitor your progress or check for side effects. Keep all laboratory and medical appointments. Consult your doctor for more details. Wear or carry identification indicating you are using this drug. MISSED DOSE: If you miss a dose, use it as soon as you remember. If it is near the time of the next dose, skip the missed dose and resume your usual dosing schedule. Do not double the dose to catch up. Call your doctor if you miss more than one dose a day. STORAGE: Store the US product at room temperature between 59-86 degrees F (15-30 degrees C) away from light and moisture. Do not store in the bathroom. Store the Canadian product at room temperature below 77 degrees F (25 degrees C) away from light and moisture. Do not store in the bathroom. Keep all medicines away from children and pets. Do not flush medications down the toilet or pour them into a drain unless instructed to do so. Properly discard this product when it is expired or no longer needed. Consult your pharmacist or local waste disposal company for more details about how to safely discard your product.